There are better places to play from than the bunkers. But should the ball come to rest in a bunker, the type of sand can make a noticeable difference in play - especially on your scorecard. Balls may form "plugged" or "fried-egg" lies in the bunker sand when the ball makes a crater in the sand on impact. Your golf course superintendent looks at several variables when selecting bunker sand to prevent your ball from being buried should your shot go astray. The United States Golf Association specifies particle-size criteria for selecting bunker sand. Sand in the prescribed range provides the best all-around conditions in terms of ball lie, firmness of footing and ease of bunker maintenance. For some golf facilities, bunker maintenance is an important aspect in sand selection. For example, a golf course that is subject to high winds would have to stay away from selecting sand that is too fine. If the sand is too fine, wind will displace the sand particles, causing a continual need for replacement. The predominant particle shape of sand and its "sphericity," - or roundness - also comes into play. 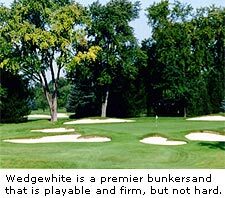 A desired bunker sand shape is angular with a low degree of roundness. The sharp corners of an angular sand help it resist movement after impact from a golf ball, resulting in fewer "plugged" or "fried-egg" lies. Truly round or "soft" sand requires a substantial amount of skill to play from. It's like playing a shot in a pudding-filled pit. Round sand needs to be avoided because it shifts more under the weight of the golfer and can allow golf balls to bury and disappear on impact. A hard, silica sand is often preferred in bunkers, since silica sand will resist weathering and retain its original shape longer. Sand such as limestone sand is more subject to weathering and the fine particles released in the process affect the playability and maintenance of the sand. Limestone sand can "set up" or become "crusted," because of the cementing action of finer silt and clay particles. Limestone sand requires more frequent raking to maintain a suitable playing surface. Your golf course superintendent may choose to have a certified soils testing laboratory help evaluate sand when making changes at the course. The lab will check the sand's particle-size, distribution, shape, color, crusting potential, hydraulic conductivity (ability to drain water) and its resistance to buried lies. 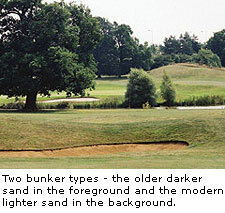 Bunker sand selection affects the condition of play as well as bunker maintenance. Always do your part to preserve favorable playing conditions by raking the area that you disturbed after hitting from the bunker. By doing so, you can help make the game more enjoyable for other golfers unfortunate enough to hit their golf balls into the sand. When choosing a bunker surface, the varying skill levels of golfers must also be considered. A lower handicap player typically prefers a hard, smooth bunker surface. However, the higher handicap player prefers a softer surface that allows them to get their club through the sand. As a result, superintendents will try to provide a surface that satisfies the widest range of players. Even though a golf course management staff devotes considerable time to bunkers, it is important to remember they are still hazards. It is not realistic for golfers to expect to hit shots with the same skill and accuracy as they do from turf. Source: The Golf Course Superintendents Association of America.